We could create a little time with Magnus Öström to make an interview just before his band's unforgettable Ankara Concert in last November in Nordic Music Festival. 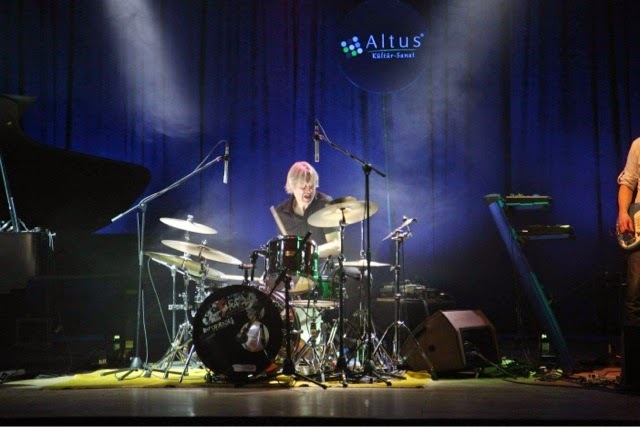 The drummer was on the same stage that he played on 9 years ago with Esbjörn Svensson Trio and he was so excited to be there again at that night. Fatih: Hi Magnus, welcome to Ankara. Fatih: I think the first time was in 2005 with Esbjörn Svensson Trio with an amazing concert. For most of the jazz listeners here, it was certainly a memorable concert. After Esbjörn's passing away you have recorded two albums with your quartet. We all can guess that life is changed a lot for you and (Berglund) after Esbjörn but here I want to ask you this: What has changed in your musical style? Can you compare E.S.T. albums with Thread of Life and Searching for Jupiter considering musical styles and the sound? Magnus: I was one third of the trio. I think I still brought my sound and my playing to my own band. So that part of the trio is still with me. I think you can hear some connections with the trio and my music but though, it's much more electrified and maybe more in jazz-rock or something. The trio was more -maybe- jazz and it was more acoustic as well. Fatih: What is new and different in Searching for Jupiter compared to the first album? Magnus: One thing is the keyboard player. Gustaf Karlof was a little bit more into the keyboards and synthesizers and he worked in those kind of things. Daniel Karlsson is more focused on the piano, more of a real piano player. Of course he plays a little bit other stuff but his focus and playing are more jazzy. I think that changed the whole sound a bit. The compositions... I don't know if it's changed. Magnus: Yeah, a little bit lighter. Magnus: I think so. Maybe that's the difference. Fatih: Besides your own band, you are playing in different projects and some albums: E.S.T. Symphony is one of these. You have given many concerts in 2013 and 2014. How did it feel like going back to the compositions with the symphonic arrangements? Fatih: Maybe -in other words- this is the best way to keep on playing E.S.T. Magnus: Yeah, I think so. Especially for the moment... But, there is also many positive thoughts coming up when you play this music. You played it so much before and you remember all the good things. You are already very thankful for the travel with the trio but it is even more when you revisit them. It's been amazing to do it. Fatih: Will you continue giving other E.S.T. Symphony concerts in future? Fatih: Will any of these concerts be recorded for the album? Magnus: We'll see. We have been discussing it but we haven't really found the right setting and the right solution yet. Fatih: Can we say that any previous concerts will not be recorded for the album - which means you are waiting for a future concert to record? Magnus: We don't have any really good recording yet. I think we need to find another one. Fatih: We are familiar with live recorded albums of E.S.T. Are you planning a live album with your own band? Magnus: I've been thinking about it but I think it's good for the band to make at least one more studio album to build the song list. Fatih: You have worked with Lars Danielsson and Tigran Hamasyan in Lars' last albums Liberetto and Liberetto II. How was it playing with them? Magnus: I think it's amazing. I think it's reallly really fun. It is also great to be a sideman because it's putting you in another position - you don't have all the responsibilities. In a way sometimes you can relax in another way. Coming there and playing his music is very very nice. I think Lars is an amazing bass and cello player and compositions are very very nice - very lyrical, nearly romantic. Tigran is another universe, he is so free rhythmically and he is in another dimension. Fatih: Especially in Liberetto II, I have heard nice trio performances which excited my mind to think about a new trio including you. Lately I also saw that you played in Jan Lundgren Trio. Magnus: Yeah, it was just a concert. Fatih: Is it any possible that we will see you in a new trio format as the main project? Magnus: I don't know - it might happen because I love the setting. No doubt about that. Piano, bass and drums... Very organic, very easy to work... It is very fast changing the development musically. If you are getting four, five and six, it is hard to turn the ship fast. I love the space. It might happen, it might not. Fatih: I think many European jazz followers agree on it if I say E.S.T. changed the way jazz is following in Europe. In my humble opinion, there were not so many jazz trios sounding like you when you were on the scene. However, after 2008 we started to see many bands which are compared to E.S.T. and most of the time they are defined by a new term called E.S.T. sound. What do you think was this E.S.T. sound? How can you define it? Magnus: Wow - that's a tough question. I think it was like a mix of our different backgrounds and our different preferences about music. One of those things that happen sometimes is when you get certain amount of people and sum, the total energy mass gets bigger than each seperate. I think it was the mixture of Esbjörn's fantastic compositions that is kind of jazz but still a lot of pop hits - they are easily accesible for anyone - you don't have to be a jazz nerd. Dan comes from a rock background. I think the combination of the energy of us three together was something special. It's really really hard to explain when you had been there. It's sometimes easier for people outside. But now after few years, you can hear "yeah we got something unique together - the sound" somehow. Also a very important thing is that especially during the late years, everybody really could open up and take their place - you know everyone got space. Fatih: Maybe it is not something to be defined but something to be listened. If you can tell in words you won't play music maybe? Magnus: Maybe, maybe... It's always hard to put words on music. Magnus: Problem with me is that I don't really follow. I have never been that kind of a guy that really checking out stuff all the time. It is hard to tell. I am trying to find any names but... For me, of course Tigran was one thing that strike me when I heard it first time. Tigran is kind of a big name but he is still very young. I think it is very interesting what he has been doing and his projects. Fatih: You are giving a name from East not from Europe. Interesting? Magnus: No, but he is kind of mixed. He is coming from Armenia but he has been living in LA for many years. Then he has been staying in France. I think the music is getting more and more like that - it is like a music from world - global. Fatih: Progressive rock was always an implicit part of E.S.T. music I think. In my opinion, in your new albums these progressive rock influences are much more than before. Have you listened to progressive rock bands a lot? Magnus: No I haven't, not really actually. My background is when I went from pop or something -when I was 12,13 years old - the first thing I heard... There was Billy Cobham. I was very deep into jazz rock for a long time when I was between thirteen to sixteen. Fatih: Between 70's and 80's? Magnus: This was from 1978 to 1981. Magnus: For me what is important is jazz-rock not fusion because fusion is even more sleek for me. Jazz-rock has some kind of rough edges. That's my background actually before I went into play in more acoustic and traditional jazz. So it's a mix from that. The only progressive rock band I listened a little bit is Meshuggah - Swedish progressive metal band. I think there is a lot of interesting things happening in metal. Fatih: What do you currently listen at home when you find time? Magnus: For me it is sometimes hard to really concentrate and listen. Just the other day, I found this beautiful beautiful record with Stan Getz and Strings. It is called Cool Velvet - maybe from 60's or something. Really really beautiful music - very soft and gentle. He also had this great album called Focus that I listened a lot to when I was like in my twenties. The last really big thing was Laura Mvula from Birmingham I think - an English girl. She sings, writes and arranges. Fatih: How do you compose? I mean besides the drum-set are you using any other instruments while composing? Magnus: Yes I compose by the piano. I am not a piano player at all but know enough to compose. Fatih: Can you compare jazz made in Europe with the jazz made in United States nowadays? Magnus: As I said before, I am not familiar really with what is happening both on the Europe scene and the scene in States but I think, of course you have this long long tradition in States. It's actually in a way music coming from blues and all the traditions. They really see the big names before them in the tradition they are carrying and they are still carrying that tradition. That's very important. Maybe you sometimes have more music from the States that are in the vein of the traditional jazz but still you have a lot of other things happening over there as well. But in Europe you might have a more free attitude toward jazz. Magnus: Maybe a little bit less pressure. But we are also standing on the shoulders of giants. You have to understand. Fatih: You have to know the alphabet, then you can produce the words? Magnus: In a way, but I think it's openning up everywhere, it is coming very experimental and very open stuff also from States and Europe. Also the free format and avant-garde style is very big nowadays. Both in Sweden, in States and in Canada. That has a revival recently. Fatih: Do you know any Turkish jazz musicians? Magnus: Of course I know Okay Temiz because he was in Sweden and I know Oriental Wind. İlhan Erşahin. Sarp Maden after EST Symphony in İstanbul and Mehmet İkiz - Swedish/Turkish drummer. Fatih: Well with all your experiences how do you see the future of jazz and music in general? Magnus: If you are talking about the business, I don't know where it goes. It is very very difficult times for people in it. There are more people than ever playing music and wanting to be musician but the scene is not growing as much. Also recording side is of course very problematic because people think that music is free nowadays - you can use spotify and whatever. Fatih: And you are caring about album sales? Magnus: It might never been that important for jazz musicians. You never sell millions for most part but still you have to get money to do the recording at least because it costs money to do a good recording. Even though you can do a lot more at home nowadays but it is not the same as to work with really professionals in a studio. That's gonna be problem in music industry and it will also hit film industry. Fatih: Yeah, it's a general problem. People can be careless about art. Magnus: The money needs to come from somewhere. It's very easy to just to think that "Ah I can get this for free." Then it starts to be a rule and it is hard to go back. Fatih: Do you like to teach playing drums to students? Are you planning to open a school or join a conservatory to give lectures on that in future? Magnus: Actually I've been to conservatory for a year now. There is a guy who was away from the school and I am asked to get his job for a while. I have five-six students. I think it is interesting. Magnus: We'll see. It's interesting though it also takes a lot of energy and also a lot of planning - you know we have just twenty four hours per day. My focus is on playing and trying to compose more music. But it is very interesting to meet young students. They have the energy. Fatih: Like Curly Camel maybe - you are the producer for them. I donated for them, for the album. Magnus: I appreciate that. The older you get the more interesting it is to work with young people. When you are younger you have a certain amount of energy. Fatih: Are you planning to release a new album with the band? Magnus: Hopefully, I will release a new album next year. Probably not before Autumn. Fatih: I am looking forward to listening to it. Thank you Magnus, it happened to be a great interview. It is great to see you here at last. Magnus: Thank you I am glad to be here.